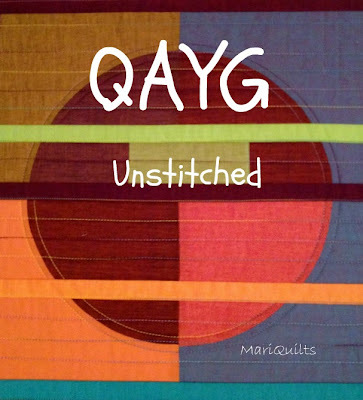 The QAYG topic is humongous (to borrow another one of my little granddaughter's favourite phrases). As a result I've started a Flickr group to share our projects and field some of the many questions, that come my way. When I look at how often I use this method, even though I have a long arm...I realize just how much I love this way of quilting. I really have no idea how to run a Flickr group, but will have fun trying. Who knows I might even figure out how to create a button, after all Lynne tells me how, right here. And If I follow along on her Touch draw tutorials, who knows what might happen.....now let's not get carried away!! If this is something you're interested in, come join QAYG Unstitched. With all that un-stitching we might just become unhinged....let's do it together, I'd love to see you over there. I've wanted to learn this method for a long time. Do you have any good tutorials to recommend? Oops! I just found your tute. Thanks! Great idea, I have joined and will post over a picture or two later on. Running all the way to flickr ! Love the idea, Marianne! I'm sure on board for it, and may even break out the Colourbox!! Ooh, lovely. I've been thinking I'd like to do this with my New York Beauty blocks (very early days yet, for that project). Read through your tute some time back, but haven't tried it yet. A Flickr group will be wonderful... heading over to join in right now. very fun idea! I've posted! Sounds fun, you are so BRAVE!!! !